Here is a fuzzy glimpse of the polar bear mother running away from camp in Bear Bay. "IT IS A BEAR"!!!!!!!!!!! !....Mille yelled out "But, oehhh it is only a little one." Then more calmly, "it is running away." By then, Paul was looking out the tent door too. "That's not a little one," he added. It is just getting further away. A few minutes earlier we were jerked out of our sleep by very sudden, surprised and angry barking by Timber quickly followed by all the dogs. Not yet awake, Mille launched out of her sleeping bag towards the tent door, ripping it open to look out, and for a split second, she thought it was one of the white dogs (for some strange reason) running away from camp!?! Then it stopped, turned around and... That was a polarbear. The bear, a female, kept running away into the nearby rough ice, from where suddenly, her two large cubs popped up. Following her, they continued away heading up a steep mountain side. Obviously, she did not care for Timber or any of the other dogs. From the tracks, we figured she was about 100 ft from camp when Timber startled her. It looked like she had been sneaking up in cover of the sled to get close to the dark spots laying on the ice. There was absolutely no wind that day, so we think she might have thought it was a large group of seals hanging out, and was very surprised when they suddenly turned into barking dogs!! Off she was. We jumped out of the tent and got some great video footage with the large zoom lens as the three bears headed up the mountain side. Timber received a grand bear hug and a huge piece of cheese as reward. That was close.. 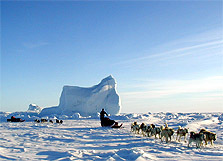 The small icebergs frozen into the ice are carved by the glaciers on Ellesmere Island. But besides lots of tracks, that was the "only" bear surprising us while in Bear Bay. Once we headed out onto Jones Sound crossing over to Ellesmere Island, it was easy traveling with some pressure ice, but to our great relief, no leads of open water. We were still a little leery making camp. For the two nights, we had to set up out in the middle of the Sound as we could here the cracking and moving below us - we were very happy when we reached Ellesmere's shore Sunday night at Cape South near the mouth of the enormous Syd Kap Glacier. What an impressive site sledding up to this magnificent Island. Mountains, glaciers, and icebergs just dazzling your mind. As we stopped for camp, we took a deep sigh. This would be our last night of camping (of course that is if the weather held for another day and there were no surprises the last little bit). We only had 23 miles left of this journey and the next morning when waking up we were supposed to be met by a film team from National Geographic News as well as Base Camp Eric and our good friend Jeremy Dies, a representative from the Lotus Corporation. We have to admit we were not sad it was to be our last night of pasta and cheese though! Waking up a little early we both opted for no oatmeal. We layed a little bit longer in our sleeping bag, just staring up into the tent walls enjoying the complete silence except for the morning noises from the dogs. A lot of things go through your head. You think of moments in the past 4 months - good as well as hard ones - and try to just make sure they are imprinted in the mind forever. It was not necessary for us to say much to each other, since we both knew all the emotions we were having today. One minute you want to just laugh. The next you just feel sad. At 11:00pm Timber broke the news - the snowmobiles were in the distance. We hurried up, got clothing on, jumped out, and there they were. Handshakes, big hugs, and lots of laughter. Jeremy had brought a whole package of fine chocolate from our friends at Lotus which Mille immediately had to open immediately and sneak preview. The next couple of hours were spent filming, doing interviews, and of course introducing the superstars - the dogs. The film crew - Kirstin, Charlie, Chad and Erin - were great. It was a lot of fun. The weather was beautiful, so they followed us to film us on the sleds for another couple of hours before heading back to receive us in Grise Fiord. Eric and Jeremy stayed with us a bit longer, serving up a delicious lunch of smoked oysters, bagels, pop, cookies, and other goodies. We were now close enough to our destination that we could see the bay, but we still couldn't see the community and while eating lunch, the fog came rolling in leaving us in a thick blanket of white. Eric and Jeremy took off on their snow machine. Grise Fiord and its surrounding nature is absolutely stunning! Being the northernmost community on this continent, we also think it is one of the most breathtaking. We were alone with the dogs again. It brings a lump to Mille's throat thinking of the last miles. "When everything became silent again, I just got overwhelmed. Just me and my dogs, our thoughts in sync, the swoosh of the runners, their ears popping up when they see a shadow in the fog, the wagging tails... I love it." Not being able to see a thing ahead except snow mobile trail we knew would lead us to the goal the last bit of running was very surreal. Paul was in front with Cola in lead. Not sure how far we had to go so he stopped to take out the GPS where he had plotted in the position in the morning to be able to "follow" the count down. It was about 5 miles yet, so another hour or so. 10 minutes later he stopped again. There was some rough ice. Eric had told us it would be smooth all the way to Grise Fiord from where he left us, then we would reach about 200 ft of rough ice and we would be standing in Grise Fiord!! This was rough...maybe...yeah... Was that not some dark spots over there right in front of us? It had to be! We were in Grise Fiord!!!! Now what? Nobody knew we were there, they obviously couldn't see us. No wait, wasn't that people? Two figures appeared out of the fog. 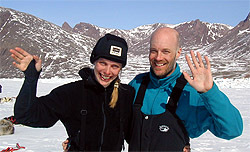 It was Eric and Christian (from Grise Fiord) who had spotted us first. Then the National Geographic crew followed. We were still in the fog, but now we knew we had reached the goal - the northernmost village of North America. We gave each Polar Husky a big hug and kisses. We did it! Staying at the Grise Fiord Lodge we are in famous company. The guest book here has been signed by such people as Sir Edmund Hillary and Neil Armstrong! We decided to put the dogs a little further into the bay closer to where we are staying, so we mushed a few hundreds yards further. The dogs were just ecstatic. It was like they just had to show us that they were still ready to go further. But we stopped. We both felt really weird - so sad and full of joy all at once. But this very moment mostly sad. It was over. Almost dreading it, we pulled out the stake outs and were setting them out, when Paul turning around called out "Mille, look up." Mille stopped and looked up. The fog was separating, and appearing in front of us, was the most breathtaking sight. 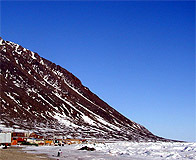 Huge brown mountain cliffs, against a blue sky, soaring gulls, and a precious little community of houses hugging the shoreline. It was Grise Fiord. Feeling unable to breathe, such beauty... this was all we had ever imagined and more. It felt incredible. Happiness. Tears. Relief. And a long hug. We did it! This incredible cake was one of many delicious treats at the feast. After (another) good lunch at the Co-op Hotel where we are staying, we headed for the Umminak School to have a good Lotus Sametime Chat Session. We just love these! We can not wait for the first one again next year! The rest of the day is sort of a blur. We spoke with family, laughed a lot, and were just happy. That evening the community and Lotus had prepared a feast to celebrate Arctic Blast 2001. What a feast! Delicious food, kind words, and lots of smiling faces in the gym of the Umminak School. It was a night we will never forget. After a last visit with the dogs we finally put our heads on the pillow - with a broad smile on our faces. The local delicacies served to us by the elders, was beluga whale blubber caught over the weekend in the nearby Polynea - Mille just loves it!! Now all there is left to do is to pack up the gear, unlash the sleds so they take up less space on the airplane, and then of course, explore Grise Fiord a bit. It is not too often you get to walk the most northern community in North America! Tomorrow we are loading up all the gear, the sleds, and the dogs into a Twin Otter airplane taking us to Resolute, then to Rankin Inlet, to Winnipeg where the dog truck is parked to take us home to Grand Marais, Minnesota. It is strange that we are going home. It has been 115 days since we hitched the dogs and headed out over the Churchill Bay. In that time, the vastness of Nunavut has become our home and the many new great friends along the way our extended family. We depart Nunavut but we will always have the countless memories and impressions with us. Qujannamiik Nunavut! And thank you to all of you out there, as well as to Connectria, Lotus, Science Diet and the rest of our sponsors, friends and family for your support all the way. It has been an incredible program this year - as we have been exploring a new way of learning, Sametime Chats, Collaboration Zones and a great territory together. Can't wait to join with you all again next year!! Once again the Polar Huskies have succeeded a grand adventure, as they set million of paw prints in the snow all the way from Churchill to Grise Fiord. The true stars of Arctic Blast 2001 are of course the mighty Polar Huskies. Ready to go home - back to the dog yard - for the summer, they all deserve to be "Polar Husky Star of the Year". The Polar Huskies on this expedition have simply performed beyond expectations, with incredible stamina and strong spirits making this journey at all possible. What makes these dogs so forceful and able to succeed is without doubt their ability to work together as a unit. Remember, (Or Keep in mind) it is all about TEAM WORK.. But the following Superstars deserve a little extra attention for a job excellent/well done! Strongest Wind/ Highest Wind Speed: 80-90 km an hour with gusts reaching 120 km/h. Highest Windchill: Off the Chart! It was minus 40 F and 60-70 km/h winds. NOTICE: National Geographic Today airing on the National Geographic Channel - If you can not receive the channel go to www.nationalgeographic.com. It will be a series of at least 5 stories and might start airing as early as next week..Check the website for updates!